After our WFR course came to an end in mid-April, I craved an escape from the desert. We had no plans for May or June, but I was feeling ready to leave the red rocks, sand, and cactuses that formed our environment for much of March, April, and parts of last fall. (A moment to reflect: I can’t believe we’ve been so many places and been living in the Fire Truck for so long! ) Generally I was just getting too damn hot. I wanted to see some family, particularly my sister in San Francisco. So we decided to head back to California. California is a huge state. We eyed a trip to Catalina Island off the coast near Los Angeles, but the cost was prohibitive for a short backpacking trip. 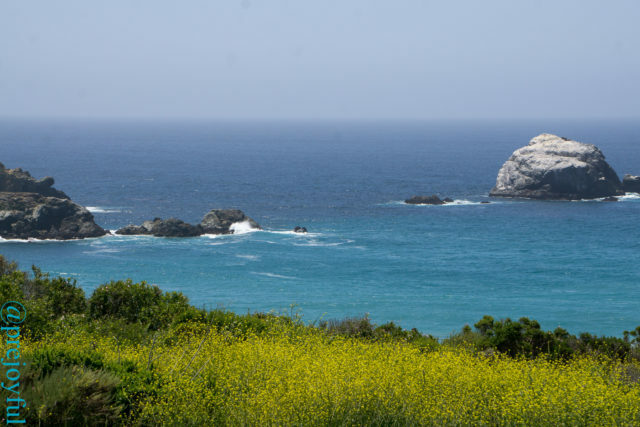 Last fall, many people recommended visiting Big Sur, so we tacked a course for the coast. 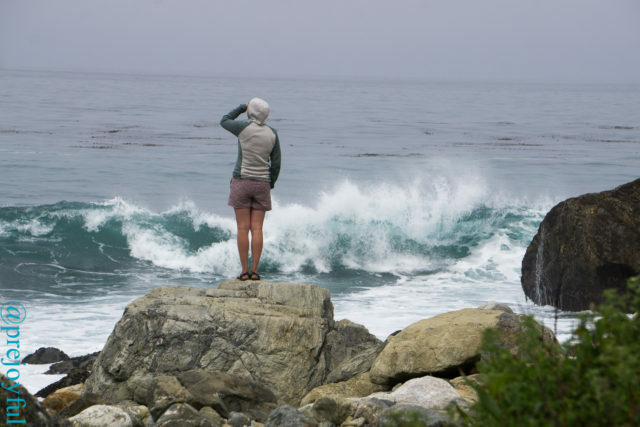 We knew nothing about Big Sur when we set out at the end of April. After an eventful overnight in the Mojave Desert, we set out through California to get to the coast. We returned to a beautiful public picnic area near the end of the Forest Service road, which served as a perfect place to splash in the ocean water and make dinner. That first day was already a refreshing taste of the coast after so much time in the desert. Annie watches otters after breakfast. The next day we made breakfast back at the picnic area, and watched the otters diving in the kelp just off shore. We drove farther up Hwy 1 to get a better sense of the options for hiking and sightseeing. For the first time in nine months, we actually stopped at a series of vista points along the road and were exuberated when we spotted whales in the distance from one pullout. There are benefits to winging it, and taking travel slowly. We stopped at Big Sur Bakery and Restaurant, which had been recommended to us last fall. After sampling their baked goods we proclaimed, “Please, take all of our money!” We spent way too long, and too much indulging on scones, then set off again and finally made it to the Big Sur Station, with visitor information and plenty of maps. 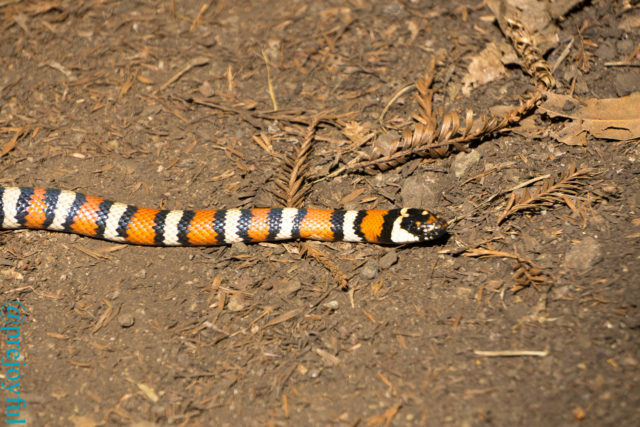 We spotted this California Mountain King Snake during the hike on our first day. It’s not poisonous! We were thrilled to see numerous trails through the Ventana Wilderness, and I had high hopes of a multi day backpacking trip. The visitor center set us up with a trail map and a website to peruse (ventanawild.org). We rapidly discovered that the longer, appealing loops were not in great condition. Coastal California has the most pervasive poison oak I have ever seen. It is everywhere. Trail reports discussed poison oak bushwhacks, ticks, and giant downed trees obscuring most of the routes we considered. Poison oak bushwhacks sound like Type 3 fun, so we decided to enjoy the more frequented areas of Big Sur. We spent the afternoon enjoying Pfeiffer Beach, a popular Big Sur destination. Since it was a weekday, we had no problem getting into the parking area. The beach is the home to famous arches in the rock, accompanied by spectacular wave breaks. Joffrey and I spent the whole afternoon climbing the arch formations, taking pictures, and doing my favorite thing: exploring tide pools. We saw fish, tons of hermit crabs, snails, urchins, and anemones. I could have spent all day just watching the creatures in each pool. On the way out of the park, we were sidetracked by the Big Sur Tap House. We stopped for wifi, beer and nachos. It was an amazing little place, with super comfortable booths and good beer. Much, much too late, we returned to our campsite that night with the intent of doing the hike to Sykes Hot Spring the next day. 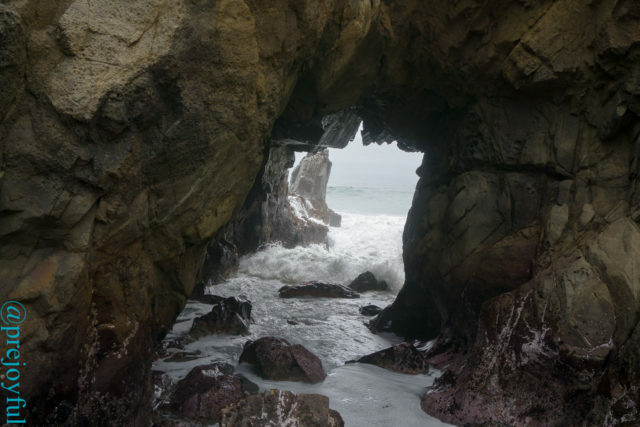 Waves break through Keyhole Arch. In the morning, I refused to wake up at six. We had been up too late, and I wasn’t feeling a 20-mile day. We postponed it, and instead enjoyed breakfast at our picnic area. Another place recommended by all was Julia Pfeiffer Burns State Park, where we did the short walk out to McWay falls. It was a pretty overlook, but perhaps not as spectacular as many claim. 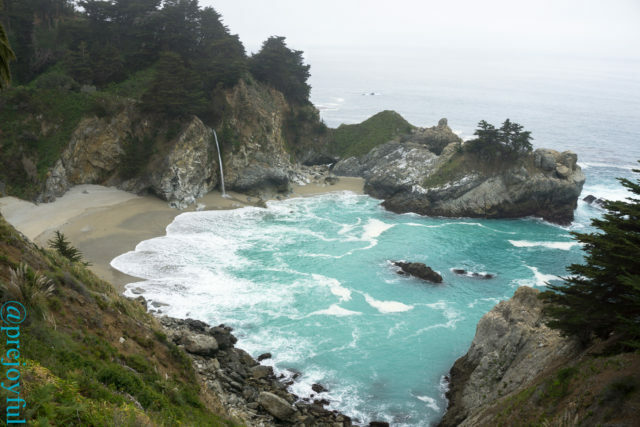 Everyone took this same photo of McWay Falls. The beach sand came from a landslide that washed out Hwy 1 for nearly a year in 1985. As we walked around the cove, we looked out over the sea, we saw a couple of whales in the distance. We watched the whales for a time, when suddenly Joffrey said “There’s one RIGHT HERE!” A couple hundred feet away, just off the coast below the cliff we stood on, a whale surfaced. 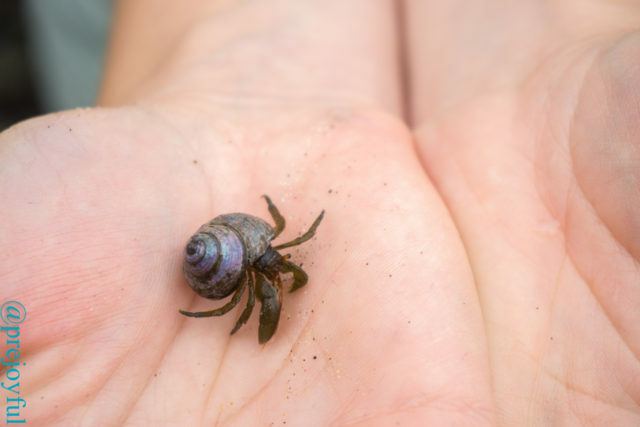 We waited a few moments more, and he came back up – I could see the barnacles on his back as it crested and fell back into the water. 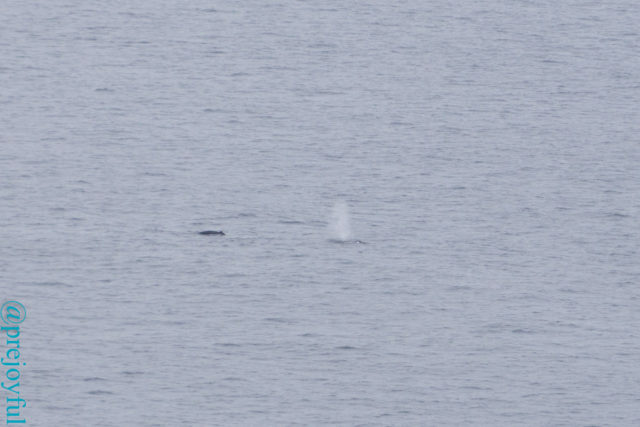 We only had two momentary glimpses, but it was the closest I’ve ever been to a whale, and it was thrilling. We spent the rest of the afternoon walking the six-mile Ewoldson loop in the park. This trail kept us out of the sun, and took us high into redwood forests, topping out with a view of the ocean. We walked up the creek to a beautiful waterfall that Joffrey climbed into to get a good fresh water rinse. In the early evening, we drove two more miles to get to a cove associated with the state park. 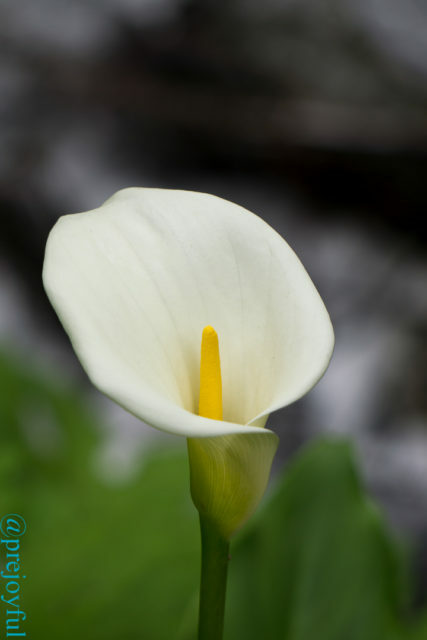 It seems to be nameless, and we wouldn’t have known it existed except for a sign in Julia Pfeiffer Burns SP. We parked on the side of the road, and walked down a dirt road towards the water. 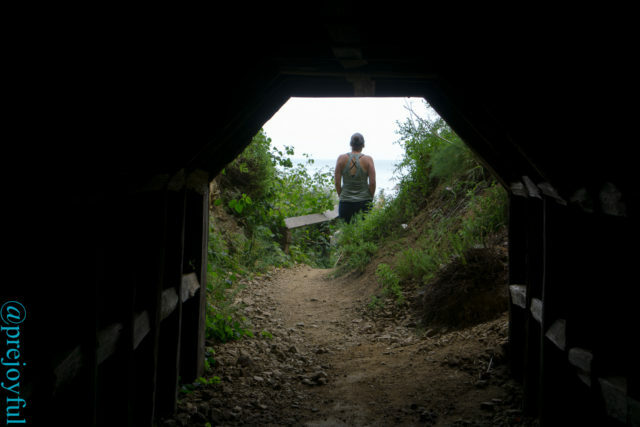 The trail split, and took us through a long dark tunnel that passed through a large cliff, popping out into a deep and beautiful grotto filled with deep blue water and kelp. No one else was in the cove at the time, so we had the waves and otters to ourselves. 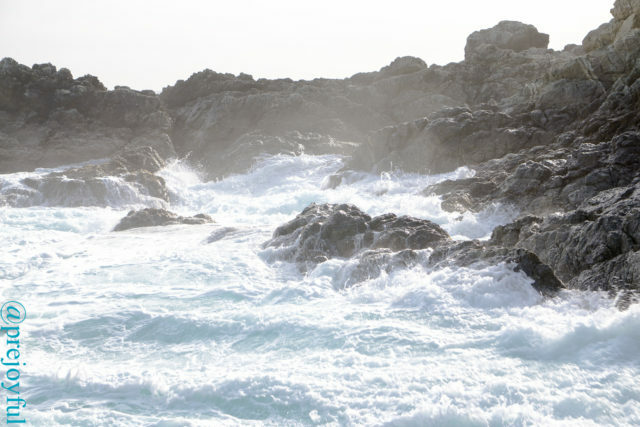 We spent another hour watching the extreme currents and height of the water as huge waves rolled into the rock formations. It was and end to another beautiful and relaxing day. Finally, on the third day full day in Big Sur, we woke up early to hit the trail. Sykes hot springs is an immensely popular destination along the 20-mile Pine Ridge trail. 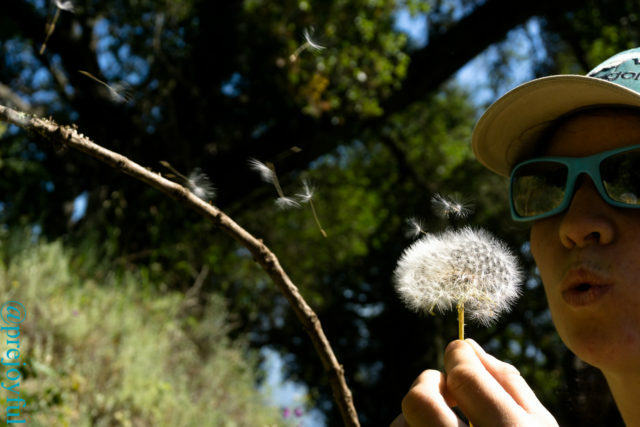 This trail is so frequently hiked that the poison oak and general conditions aren’t too bad. The idea of hot springs sounded appealing, but Joffrey and I also didn’t wanted to stay at a too-often-visited campsite and deal with lots of backpacking crowds. We decided to turn the 10 mile “backpack” into a 20 mile day hike, with a few hours to hang out in the springs around lunch time. We didn’t start out on the trail particularly early. Around 7:30 am we took our daypacks, snacks, and Sawyer filter and set out. 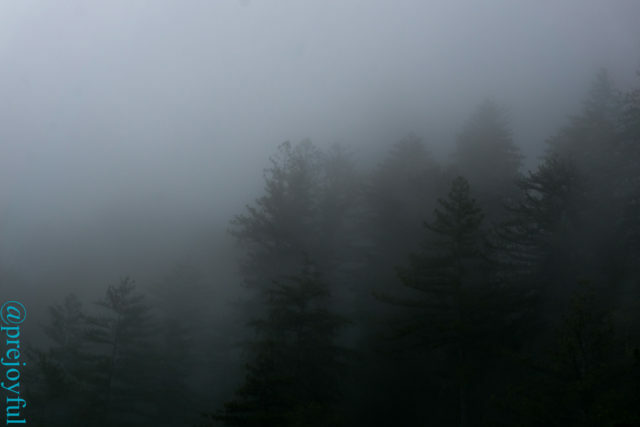 The fog rolled in, turning the forest into a misty mystical place. 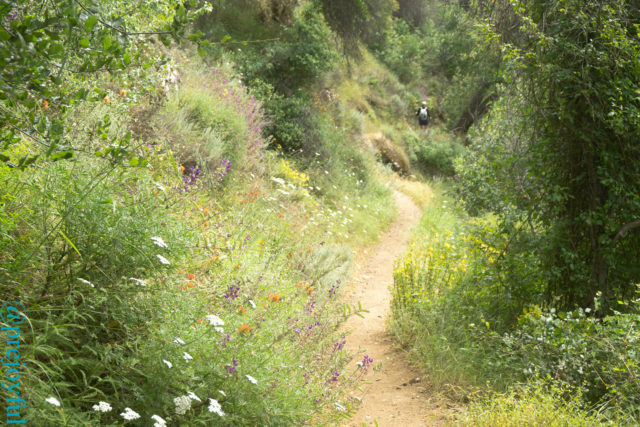 The terrain in California is steep and rugged, yet the trails are all smooth, hard packed dirt with switchbacks at low grades. It makes for easy and fast walking. We cruised the trail, but began passing people hiking out at about mile four. The trail is beautiful – it takes you up a valley that looks out over the peaks of the Ventana. The redwoods are majestic, and I can’t help but feel like I’m on a different planet as I walk through the tall trees. We crossed a few running creeks, and arrived at Sykes Camp just before noon. 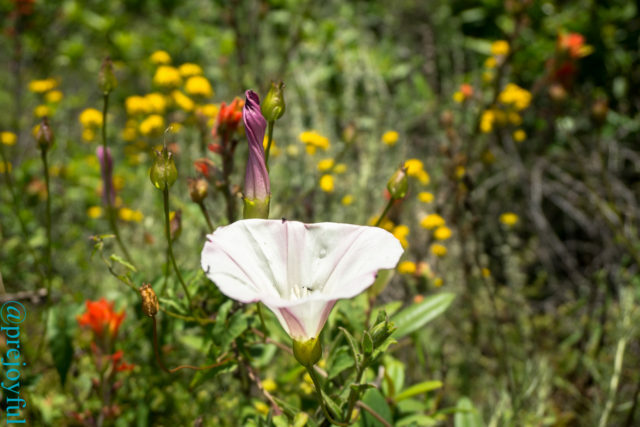 Wildflowers abound along the trail! Joffrey and I always make a game out of estimating how many people we will see any given day during a hike. Our morning guesses were 35 and 20 people respectively. By the time we reached the river, we had already seen thirty-seven people. Given the number of people we encountered on a Wednesday, we would not recommend trying to even do a day hike to this destination on the weekend or holidays. It must be complete chaos. The hike seems to be a popular destination, and reminded me somewhat of the forks of Red Creek in Dolly Sods, WV. It’s a magical and easy destination for beginning backpackers, and the logistics are easy for people who are tourists or passing through the area. There’s no permit system in place, and no restrictions on things like dogs or campfires. LNT ethics were quite explicit on the trailhead sign, on the campsite area sign, and on the paper map that the visitor center had handed to us. While it’s nominally a “wilderness” hike, this is as far from a true wilderness experience as one can get in the woods. It turns out we had chosen our day hike scheme well. By the time we arrived, most of the previous night’s campers had already departed, while the next night’s groups hadn’t yet arrived. We spectacularly found one of the tiny hot spring tubs empty (there are two small tubs made of rocks and cement, with kind of half built third tub made with sandbags). Two people fit comfortably in this lower tub, and Joffrey and I hung out in the 102º water for a while. It was warm, and relaxing. A great way to end an easy ten miles in, and to prepare for the ten out. We enjoyed the tubs, and were glad we didn’t have to wait for space to open up to experience them. Annie enjoys Sykes Hot Spring. With that said, we were much more enthusiastic about the beautiful, crystal clear river. Joffrey found the most amazing swimming hole upstream of the camp. We rinsed the sulfur hot spring water off and quickly swam in the cool river. I ogled (and chased) the amazing salamanders swimming along the river bottom. Overall, with a much warmer day, we could have spent hours swimming in the river. Given our late morning start, we let ourselves air dry and headed back out on the trail. Again, the hike went easily, and we were back at our car after only eleven hours on the trail, including lots of time playing in the water. We passed a total of 57 people on our hike. 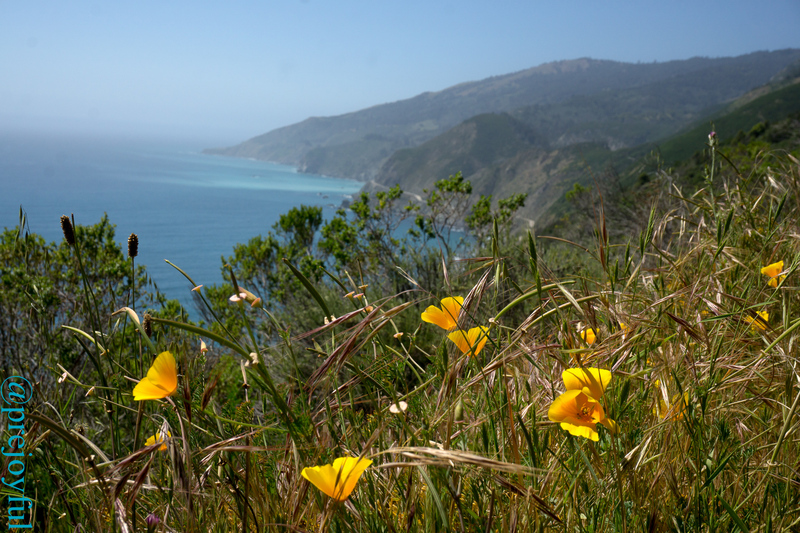 It was a fantastic part of Big Sur, and a worthwhile trip, but also a well-trodden route. 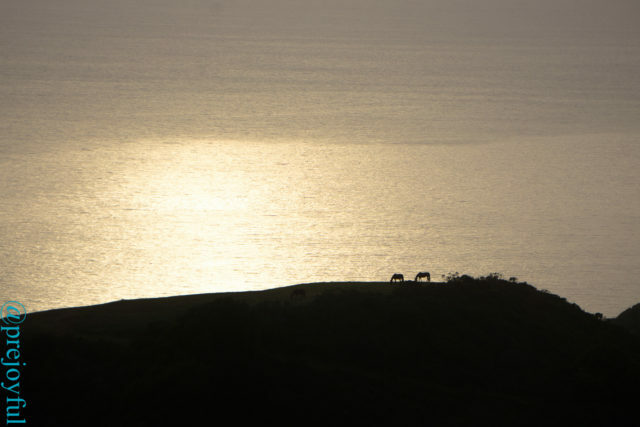 Big Sur was relaxing, beautiful, delicious, and rejuvenating. On the other hand, it’s time for us to head farther away from the crowds and coffee shops. Time for the next adventure! 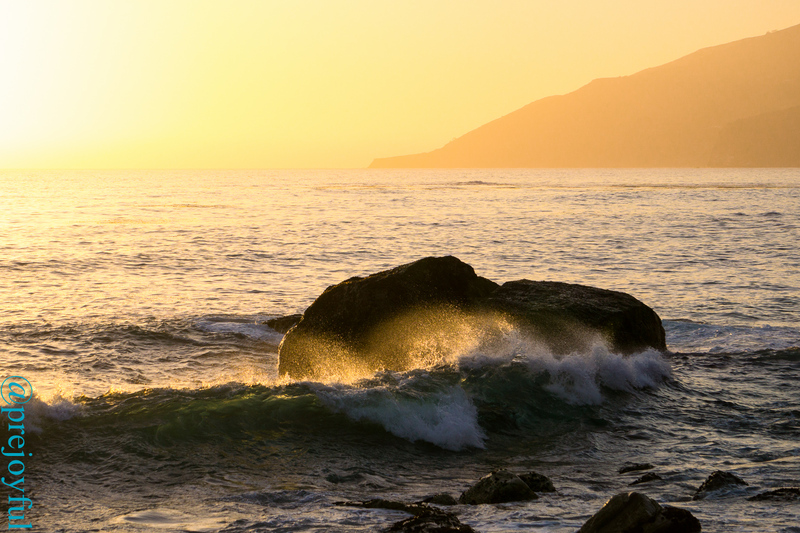 The Big Sur coast can be stunning!